Kobe consists of the southern urban area facing the blue sea and northern green-rich rural area house of nature. 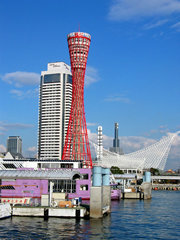 The city-planning of Kobe has utilized the topographical feature fully to create a city of variety. From the days of natural pearls of Nagasaki and Ago-bay, before cultured pearls came into the market, Kobe was the place of pearl trading with the help of foreigners living in Kobe acting as intermediaries with good contacts in importing countries. Japan became an exclusive producer of cultured pearl in the world when our pioneers established pearl culturing techniques which had been a dream for mankind from ancient times. However, "Pearl" was still yet considered to be a luxury item for common people in Japan in those days. Majority of the pearls produced in Japan were exported to Europe and the United States through the Port of Kobe. Since most of pearl cultivation was practiced in the western part of Japan, all the pearls in Japan gathered into the Port of Kobe, the largest port in the Kansai region. Since then Kobe continues to be the center of cultured pearls, and Head Office of Japan Pearl Exporters' Association is located in Kobe.